The theme for this year's NCTE convention was Dream, Connect, Ignite! As I reflect back on my days in Las Vegas, I think these are great verbs for what happened to me. Because of the amazing sessions I attended, I can "dream" of how to refine my own teaching practices. I was able to "connect" in many ways - I connected my learning to others, I connected with old friends, and I connected with new friends as well. And finally, "ignite!" As I reread through my notes and my tweets and others' tweets from #ncte12, I am ready to ignite the learning that goes on with myself, in my classroom, my school, my district, and my PLNs that span the nation. When you get to hear many wonderful speakers at a convention like NCTE, it is hard to choose favorite quotes because there are sooooo many! However, I'd like to quote Mary Ehrenworth (she presented with Lucy Calkins and Chris Lehman) right here. Her quote, more or less, was, "Our students don't need good teachers, they need good schools." She went on to say that our students should not just feel lucky to get a certain teacher in a certain grade; rather, we as schools should be working together so that our students are getting the promise of a good school, so that it doesn't matter what teacher they have; we're all working hard together. To achieve that, we need to put forth effort in having conversations with colleagues that allow that promise of a good school to happen. That one concept really started my wheels spinning. And I knew I wanted to try to pay things forward so that maybe conversations could begin with colleagues that either couldn't attend the sessions I did, or colleagues that couldn't attend the convention at all. I decided I would take all my notes from Google Docs and share them. Then, if anyone sees something that sparks their interest in these notes, maybe we could begin a conversation to further examine a topic together. I'd love to begin a dialogue with anyone interested!! Learning really is best done as a collaborative effort. 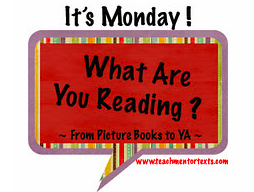 seeing many of my Choice Literacy friends - how proud I am to be associated with their smart thinking and love of fun! going to see the Cirque de Soleil show, Love, featuring Beatles music -- it was amazing!! So there you have it! #NCTE12 was a fabulous mix of learning, fun, camaraderie, and books galore! I am very grateful for the experience! My favorite slot machine - Grease! MaryLee and the teacher guide she wrote! Janet Tashjian - hope to see her in Ohio soon! 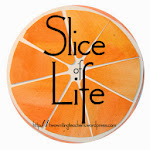 What a privilege to talk to R. J. Palacio and connect as moms. Jon Scieszka appreciating the loss of my first book and the reason for getting another!! Choice Literacy friends, Joan and Gail - two of my favorite people! Today, my two language arts classes had an amazing visit with Stephen McCranie, the author/illustrator of the Mal and Chad graphic novel series. What a fun time we had, and Stephen was a wonderful guest! Every story should focus on two things: 1) what does my character want? and 2) what is getting in the way of the character getting what they want? An easy formula for writers to follow. He shared that he will frequently write up to 14 or 15 drafts like a screenplay before he ever starts a sketch for the graphic novel. I have a lot of students who want to sketch frequently during writing workshop; it was great for them to hear from this author that if you don't have a good, solid story, the pictures won't matter. Stephen said it is easier to rewrite words online than "rewrite" pictures. He stressed how important editing is in his process. One of my favorite lines: he told the classes that creativity is a muscle you make stronger by practice. What great advice for those students who don't feel like they have any creativity - they can work to achieve that creativity. Stephen designs his drawings with a special computer program, and he was able to screen share it with us in real time. Based on his formula, he asked for the students to give him a character - they chose MaryLou. They decided that MaryLou liked a boy named Bob, but that she was jealous of another girl, Priscilla. As the students fed him the details for the story, he sketched it all out for them - it was so impressive to have him talking, answering questions, and drawing at the same time. 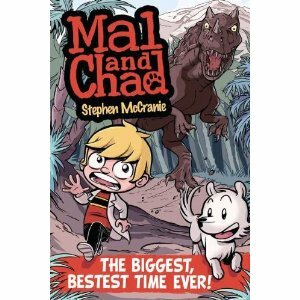 And if the Skype visit wasn't enough, Stephen also sent us a signed copy of everything he drew today so I can copy it for the kids AND he sent the first few chapters of the next Mal and Chad graphic novel. What a wonderful experience!! A huge thank you to Stephen McCranie for his generosity of time, talent, and writing wisdom!! I've been a little busy with beginning of the school year, but I have finally begun to read again, and I thought it was time to share some of the books. It's nice to be back with all of you!! Gone Girl by Gillian Flynn - This is the book for my adult book club meeting this week. I was totally into it, especially after, as a friend of mine calls it, the OMG moment. Can't wait to have a conversation about the very convoluted characters in this book. Dolphin Baby by Nicola Davies - A delightful book by Nicola Davies that taught me some things I didn't already know about dolphins and their babies. 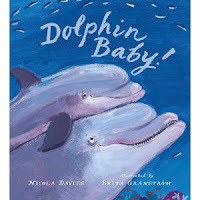 There is one story line about the baby starting with birth, and in addition, there are facts about dolphins placed on appropriate pages. Kids will really enjoy this. 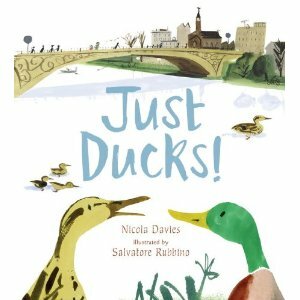 Just Ducks! by Nicola Davies - Much like Dolphin Baby, Nicola Davies has put together a story line about a little girl waking to the sounds of ducks and then watching them throughout the day. Embedded around the text are many facts about ducks. Another kid pleaser. The Beetle Book by Steve Jenkins - Steve Jenkins is a master of nonfiction and he doesn't disappoint with The Beetle Book. 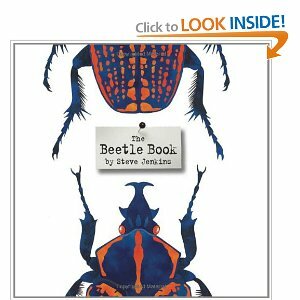 Each beetle represented in the book is masterfully drawn, and is accompanied by wonderful details about that particular species. So much information on each page; this is a book to savor. Seed by Seed - This is a lovely book by Esme Raji Codell that starts with two children looking out the window and ending with a journey back to the life of Johnny Appleseed. Readers will get a sense of what a good and kind man he was, and will learn some important life lessons along the way as well. I, Galileo by Bonnie Christensen - I have many students that will love this book. 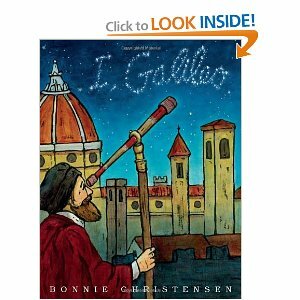 The idea of investigating ideas that intrigue you over a period of time - the perseverance Galileo had to have is amazing.